It's important to ride safely in the bush and a few basic rules have been drawn up to remind everyone to take care. Please wear your bike helmet at all times when you are riding. Ensure your bike is properly maintained, especially the brakes. Obey the normal road rules of keeping to the left, and approach all track crossings, corners and hillcrests with caution. Give way to overtaking riders and remember that riders going downhill should give way to those going uphill. Ride defensively and in control at all times. The way you ride will influence the image of MTB orienteering so practice low-impact cycling. Don't skid and don't ride around water bars -- erosion is a trail's worst enemy. Remember that you must stay on tracks marked on the competition map, no short cuts through the bush are allowed. It is also very important to take care of the environment. The organisers will ensure that any closed tracks or sensitive areas are avoided or marked clearly as out-of-bounds. It is up to you to stay off these areas and to ride in a manner that minimises the impact you and your bike have. If you are uncertain about any aspect of the event, please ask for help before you set off. You should check that you have the following items, and will not lose them during the event: Bike helmet, map, SI stick (or control card), whistle (recommended), compass (if needed) At most Mountain Devils events SI sticks are used at the start. This means you can start when you are ready by placing the SI stick into the SI-unit (as shown below). The unit will beep and flash to register the that you have started. IMPORTANT: Before you start your race you must "clear and check". Near the start area, there will be two SI-units - one labelled "clear" and one labelled "check". You must place your SI stick into these units and wait for the beep to indicate the "clear" then "check" has been successful. This process removes the previous data on the card. Failure to "clear and check" may mean that some of the controls are not recorded and you will been disqualified. Note: at events where there is a mass start you will not need to use the SI stick at the start. Once you have started, navigate to your first control when you are ready. The first control should be taken particularly carefully, as you will not yet be used to the map (or "into the map" in orienteering speak). It might take you a couple of controls to get a feel of the scale, symbols and type of mapping. Orient your map so that it is alighed with the ground, using the tracks, and your compass. Try to match mapped features with what you see around you and vice versa. Be aware of the distance you are travelling. MTBO courses are entirely on tracts and you must never take your bike off the marked tracks. Control markers will be located beside the tracks so you will not need to leave the track to punch the control. In an MTB event, you must visit each control markere with your bike; you can not leave your bike and go to a control on foot. Each control has an identification number. For example, if you are going to first control, it might be written on your map as 1-63 (next to the circle), meaning that the first control is number 63. When you reach a control you should check that the identification number matches the one you are expecting. Once you are sure that it is the correct control, insert your SI stick and wait for the beep and flash, as described for the start. If you find that the SI-unit does not beep or flash (or if the event is not using SportIdent technology) you will need to use the pin punch. The pin punch is a bit like a stapler, with a number of pins which will leave a unique pattern of holes when you "punch" your map or control card. Often the punch will also be on top of the control stand (see above picture), or it may be hanging on a string below the control flag (below). Many orienteers carry a spare strip of cardboard to use as a punch-card in case the SI-units are faulty. If you have not taken this, you will need to punch the side of your map and let the organisers know at the finish that the unit was not working. Occasionally, SI-technology is not used at an event and you will need to carry a "control card" (see below). When a control card is used the pin punch system is used at every control and you need to match the control number with the appropriately numbered box. After punching the control, move a short distance away to plan your route to the next control so that other participants can get to the control. It is extremely rare for someone to be totally lost at an MTBO event. It is more likely for you to be unsure of your exact position but to be somewhere relatively near the control. First try to relocate yourself. Use obvious features such as track junctions, hilltops or creeks if available, or go back to your previous control. You can ask somewone for help - this is permitted for beginners though not for experienced orienteers! If you are still "geographically embarrassed" head for a major road and follow it back to the start, or wait at any control your find for a competitor or the event officials to come and collect it! 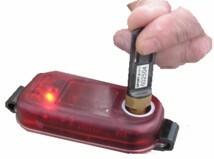 Only use the emergency whistle signal if really lost (or injured), as others are expected to abandon their course to assist your if they hear this signal (six blasts at ten second intervals, a minute pause then repeat). As with all sports, injuries can occur. You can minimise the risks by warming up correctly, riding sensible (not beyond your skill level) and obeying all directions from the event organisers. In case of minor injuries, the event organisers will have a first aid kit at the registration but it is advisable to have your own first aid kit available to treat any simple grazes or injuries. If you are seriously injured on the course and unable to make your own way to the finish, the emergency whistle signal (six blasts at ten second intervals then a minute pause before repeating) can be used to attract help. Orienteers who hear this signal are expected to abandon their course to assist in what means possible. The finish is marked on your map as a double red circle symbol. It is usually also flagged with the "FINISH" banner. You will need to insert your SI stick into one of the units at the finish to record your finishing time. You must then proceed to the "download" table to record your finishing time - this is usually at the registration area. If control cards were used the event official will want to review them, and if you hired an SI stick they will collect them here. Alway report to the registration / download area when you return, even if you have not completed the course. Courses close at a time predetermined by the event organisers (as advertised on the event details) and you must return to the finish by this time. If you have not presented yourself to the desk at this time, the organisers will presume you are still on the course and will start arranging for people to search for you. Please avoid such unnecessary searches by letting the organisers know you have returned from the course before leaving the event.